Sechs mittelständische Unternehmen aus der PBS-Branche (Renz, Han, Maul, Rössler, Sigel, Veloflex) bilden die Initiative Standort Deutschland. Der Mittelstand bildet das Rückgrat der nationalen Wirtschaft und Gesellschaft. Durch nachhaltiges Produzieren, Handeln und Wirtschaften schaffen und sichern diese Unternehmen Arbeitsplätze. Zu Anfang dieses Jahres hat sich das sechste Mitglied der Runde angeschlossen: Die Firma Rössler Papier GmbH & CO. KG in Düren. Renz is the global leader in ring wire production used for binding calendars, books and brochures etc.. The company, which has a long tradition and celebrates its 111th birthday this year, builds punching and binding machines for ring wire comb, plastic comb and spiral binding from small office machines to fully automated high speed lines. Renz also produces and supplies a full range of binding consumables and accessories for offices, schools, copy shops and the entire printing industry. The delegation came to see the Renz Stand at “Hunkeler Innovationdays” trade fair in Luzern, as well as visiting in Heubach. The main interest from this delegation was in the latest possibilities for automatization. Amongst other developments Renz presented their new concept for Photo Calendar Binding and Photo Book Production. On a visit to a large printer near Heubach the Chinese delegation had a chance to see a large professional printer with highly qualified operators producing both digital and offset work. A skilled worker shortage and high demands on quality also accelerate in Asia, as in Europe, the trend towards high automatization in printing industry processes. Renz focus their sales activities on the fast-growing Chinese market and will be exhibiting on a 200 m² Stand at the China Print fair in April in Dongguan. Our dealer Fellowes-Beswick in Johannesburg, South Africa organized a 4 days Open House end of August 2018. This event took place in their own company and many customers and re-seller followed the invitation to this quite exciting event. Our dealer Fellowes-Beswick in Johannesburg, South Africa organized a 4 days Open House end of August 2018. This event took place in their own company and many customers and re-seller followed the invitation to this quite exciting event. Fellowes-Beswick has been actively approaching the Print Finishing Market during the last few months and has successively taken over the sales of Renz semi-automatic machines - all these efforts led to the creation of an own show-room just for Renz products. 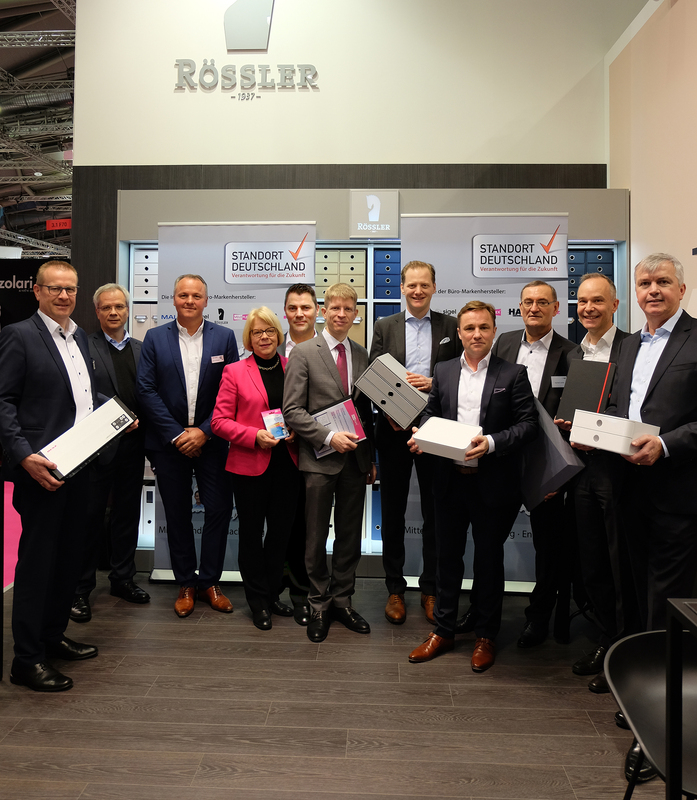 The ideas and the design of the showroom were inspired by the Renz Dealer Seminar that took place in April this year in Heubach, Germany with more than 40 international dealers and representatives of the Renz company. The cooperation between Fellowes-Beswick and Renz has been very successful, target-orientated and extremely professional. All this resulting in steadily increasing turnovers. The picture shows (from left to right): Warren Hodgson (Inland Manager - Print Finishing), Gavin Beswick (director), Olaf Gerber (Export Manager, Renz) and Andy Woods (director). Max Spielmann has taken delivery of 450 calendar binding kits from Renz UK, marking the supplier's biggest ever multiple machine order.